Today as we look at Studio J, I want to share a technique that works very well in classic pages as well. I’m going to share two layouts with you right off the bat. The first one was made with Stardust, the second with Tinkerin’. I am very slowly making my way through my son’s first year album. (Isn’t he just the cheeky little monkey?) My daughter’s album is super thick, with lots of pages based around all sorts of different things. 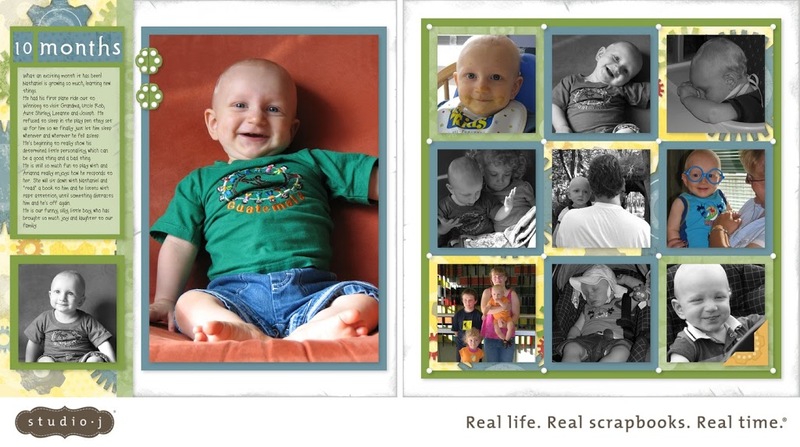 I have learned a lot about scrapbooking since I did her album. I’ve learned which photos are needed to tell the story, that you don’t have to scrapbook every single little thing, and that you can streamline the process and still produce a layout that is just as memorable and precious. 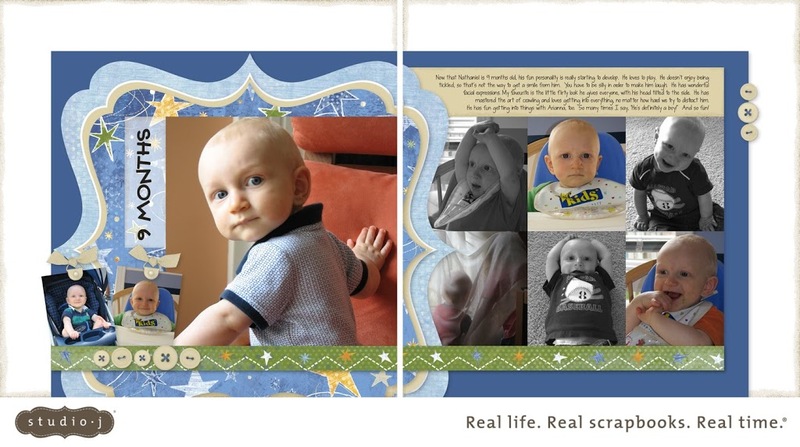 These are two of the layouts I’ll be adding to his book. Every month we took photos of Nathaniel sitting in this chair. I’ve made sure to include one of those photos on each layout. I was going to an all day crop and so I printed off a bunch of photos to use. I found them limiting (all in 4×6) and although I was able to make some nice pages, I love these ones so much better! I didn’t have to think ahead of time to print off 8x10s of him in the chair. I rarely get 8x10s because they’re so pricey! Now, with Studio J, it doesn’t matter what size the photos are. That’s one way to focus on those special photos. Another way I’ve used on these layouts is to turn only some of them to black and white. The eye is drawn to those colour photos more. This is easy to do with digital photos on a computer before you print them. It also helps eliminate some of the distracting colours if you have photos from a lot of different occasions like I do. What about those other photos I already printed? None of them are black and white. So my other pages have a lot of colour on them. That’s not necessarily a bad thing, but I really love how you can focus on the photos that have matching colours in them or ones you really want your readers to see by using this technique. Now I have a challenge for you. Go to Studio J on my website (or your consultant’s own site) or use your classic supplies and create a layout to showcase some of your most precious photos. Then come back here and tell us what you did. If you can take a photo of it or you order a jpg, post a link to the photo, too. I think you should definitely do this, especially since it’s my birthday, as a gift for me. Hee, hee. Great layouts. I love Studio J as well. Your little man is super cute. And happy birthday to you. I hope you have a great one.